ORIGIN: Ibaraki dōji was one of the most famous and most feared demons to wreck havoc on Japan. She was the chief deputy to Shuten dōji, the greated oni of all. Not very much is known about Ibaraki dōji’s life; it isn’t even known if Ibaraki dōji was male or female. Most stories and illustrations depict Ibaraki dōji as a kijo, or a female oni; yet there are other stories which refer to Shuten dōji’s deputy as a male. There is also a possibility that not only were the two partners in crime, but also lovers. What is known is that Ibaraki dōji was a wholly terrible and fearsome monster, bent of wreaking as much havoc in the human world as possible. LEGENDS: Ibaraki dōji’s most famous story takes place at Rashōmon, the southern gate of old Kyotos city walls. Rashōmon was built in 789, but after the Heian period it fell into serious disrepair and became known as an unsavory place. It was overgrown and unkempt. Thieves and bandits hung out near it. It even served as a dumping point for unwanted babies, and a spot to dispose of murder victims. 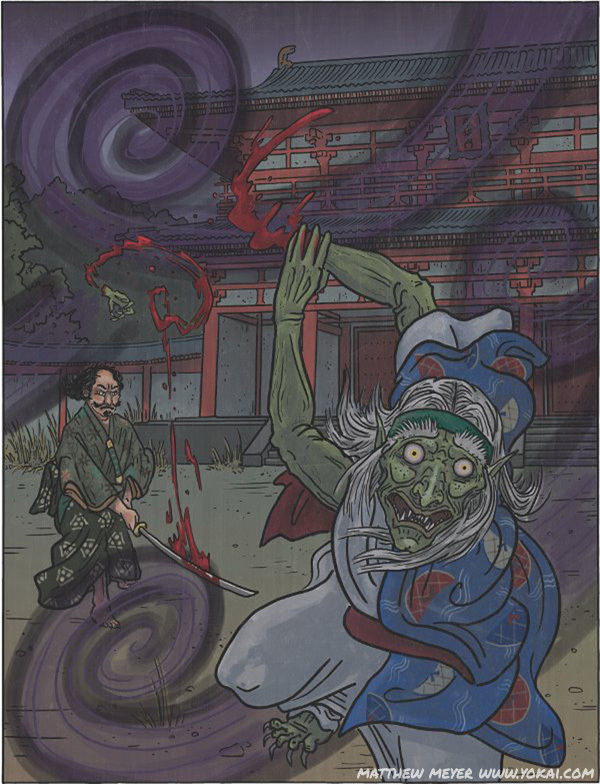 But the scariest part of its haunted reputation was the legend of Rashōmon no oni — the demon of Rashōmon. After his celebrated victory over Shuten dōji, the hero Minamoto no Yorimitsu returned triumphant to Kyoto. He was celebrating at his home with his deputies — Sakata no Kintoki, Urabe no Suetake, Usui Sadamitsu, and Watanabe no Tsuna — when Fujiwara no Yasumasa, a noble, informed them that an oni was seen haunting Rashōmon gate. Watanabe no Tsuna, having just returned from a great battle with Shuten dōji’s clan, could not believe that there were any oni left, and single-handedly went out to investigate. He mounted his horse and went south. When Tsuna arrived at the gate, a great howling wind broke out and his horse could travel no further. He dismounted and went on foot. Approaching the gate in the fierce gale, he noticed an enormous hand suddenly reach out of the dark to grab his helmet. Tsuna wasted no time, and swung his great katana around, severing the arm of an enormous demon: it was Ibaraki dōji, coming to avenge the murder of Shuten dōji. The injured demon ran away, leaving her arm behind, and Rashōmon was no longer haunted. Ibaraki dōji later returned to Rashōmon, looking for her arm. She disguised herself as Watanabe no Tsuna’s wetnurse, and was able to steal back her severed arm and flee. After that, her whereabouts were never known again, though for many years after, occasionally in some town or another, villagers would claim that they had seen Ibaraki dōji coming or going, always in connection with some kind of mischief.